There’s pumpkin spice flowing through the air, leaves crunching beneath our boots & warm wool mittens pressing against our skin... it’s fall! And with fall comes a wonderful time to show our gratitude. Thanksgiving is a time to regard the harvest’s that have surrounded us throughout the past year. Our art department has been preparing for our family Thanksgiving feasts coming up this Thursday. We have been able to use our Windsor line for so many of our decorations (you can view our gallery here). Pictured above is our Windsor 1 hour album that arrived just a few weeks ago. We were so excited by how beautifully everything came together! We would like to show our gratitude to you our viewers for helping us make this blog amazing! The language of gratitude most appealing to us is to have a giveaway for our Windsor 1 hour album. Our 1 hour albums are incredibly easy to use. All the pieces are cut for you and you can actually put it together in 1 hour (we’ve tested it)! If you don’t believe us, try it for yourself. They are available in lots of sizes and different paper lines. See, simple as pumpkin pa (<---my southern accent)! It's yummy goodness, I tell you! I love to be lucky and win it! Love the new blog. Keep up the great work! LOVE the one hour albums! They are the best! Keep up the awesome work & I LOVE your new blog! YAY! The Blog is great. Love these new papers. I cannot wait to see them overhere in the Netherlands! be lucky and get to see it. What an awesome kit - that paper is so pretty! I do love this line... this would be perfect for an event i need to scrap!! Thanks!! Oh wow, looks like a beautiful line!! I'm grateful for SEI. Happy Thanksgiving to everyone! A one hour album-something I might actually be able to do-what a great giveaway. Your new blog is just fantastic, thank you so much for starting it! Now this is for an awesome ThanksGiving-Away. I just love this paper and would to play with this. Great blog and love the inspiration. Thanks for a chance. Ooohhh, I haven't seen the Windsor yet. Guess I have been slacking. Also I have yet to try the 1hr. albums. So glad you guys started a blog!! YEAH!!! I love these easy albums! I have the hardest time coming up with ideas sometimes & you take all the hard work out of it. I would love to win the free album. I love the new Blog too! I really love those colors! What a great idea to start the SEI Blog! The new Windsor collection is fabulous and is perfect for a 1hour album. What a great gift! I love this line for heritage albums! It's perfect for my aged photos! I haven't seen Windsor in person yet--but I would love to! Thanks for your great products and giving me a chance to win! oooh SO nice! Thanks for the opportunity! I love your product and would love to win! I loved the Windsor club sei kit from Sept! Oh my, I love giveaways but what I love even better is those one hour albums. Those things are perfect for putting together trip albums in a snap, they are my fav!! 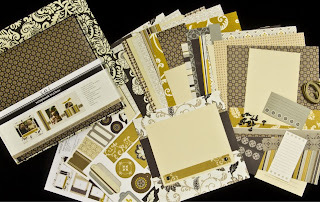 Love the Windsor collection-neat colors and patterns and so classy looking. Oh I love Windsor too! Please pick me!!! Wow, what a neat idea. I need something like this with as many pictures as I have. Great colors too! I just love your one hour albums! As well as my niece. And the Windsor line is just to die for! I think the 1 hour album concept is so awesome. Also, love this Windsor line, would LOVE to be the winner!! Lovely lovely line :) Thanks for the opportunity - have a great Thanksgiving!!! Wow, I love that line! Love the new line. Hope I have the opportunity to Win. Keep up the phenominal work! !Happy Thanksgiving...Gobble, Gobble!! Windsor is great, and I love the one hour albums! Of course I love everything SEI, too. ya the 1hr albums are supa :) and you could not draw on a better day---my bday!! love the blog btw! been following you through my google reader! y'all have been doing a great job with the blog! keep it up and have a happy thanksgiving! Love the 1 hour albums and the new blog is great. Happy Thanksgiving! Wow, so cute, and I love the new blog!! I have really become a fan of SEI since I attended a class at convention in April. I love their stuff I get on the club and I love your blog! I am loving your Monday blogs. They are such great ideas. Thank you!! WOW!! an amazing give away! thank you! Your blog is fabulous! Love the blog and would love an album. Happy Thanksgiving to you, also! So happy SEI has a blog now. I totally dig all the SEI lines, and Windsor is a great bnew addition. I can just imagine my Europe picturs all over it! So happy to see SEI has a new blog! This new line is really beautiful. I have been using 1-Hour albums since I was introduced to them 2 years ago at a Scrapbook Expo class. They are perfect for event/theme scrapbooking. I have a shelf of completed one-hour albums that look like I spent more time on them than anyone could guess, but were actually completed in much less time! Thanks for coming out with such wonderful, quality products! You have a great blog, lots of inspiration. What a nice way to share your Thanksgiving. Congratulations on your blog. We are the creative department. We work with wonderful people with wonderful ideas to share with you.